We eat WAY too many carbs! I know it – and the growing number of low–carb proponents (doctors and fitness experts) know it. However, our government policy makers do not. The current Dietary Guidelines (dated 2010) recommend Americans consume between 45 and 65 percent of their calories from carbohydrates. That’s over 50% of our calorie intake! The 2010 Dietary Guidelines for carb allowance averages out to 55% of calories from carbs. If we use this 55% average and consume 1,000 calories per day, 550 calories would come from carbohydrates or 138 carbs — wow! If we use this 55% average and consume 2,000 calories per day, 1100 calories would come from carbohydrates or 275 carbs — that’s downright dangerous! 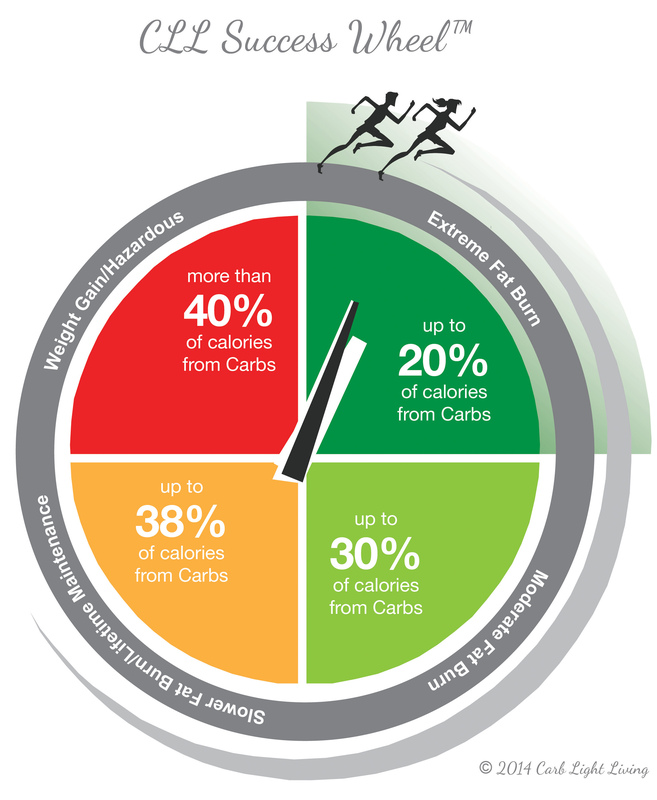 The Carb Light Living™ 2014 Guidelines for carb allowance averages 40% of calories from carbs. If we consume 1000 calories per day, this means that ONLY 400 calories would come from carbohydrates or 100 carbs daily. If we consume 2,000 calories per day, this means that ONLY 800 calories would come from carbohydrates or 200 carbs daily. I created a chart after crunching data from many low-carb weight loss programs, which is a good start to getting all of us to meet our weight loss goals. I also created the CLL Success Wheel™ to show the Daily Total Carbs you have chosen to consume at your personal calorie level. There are many variables that one must apply when customizing their own CARB LEVEL, including age, gender, metabolism, current height, weight, and particularly your activity level. This chart is a tool for you to individualize your own CARB LEVEL – whether it is for weight loss or for maintenance. Think of this program as a new way of life – the CARB LIGHT LIVING™ WAY OF LIFE. All of these materials are available in my latest recipe collection, the Top 5 Low Carb Recipes presented by Carb Light Living™ available NOW on Amazon. Together, let’s create a new lean and healthy standard for all the people of the world. I see this as a “program of the people, by the people, and for the people,” to use just a few of those powerful words from our great American President Lincoln. A little about me… We have an obesity epidemic in America, even among our children! We have soaring rates of heart disease, cancer, and Type 2 Diabetes. Appalled at the rising costs of health care and super sensitive to the human element – the physical and mental suffering that accompanies obesity, I decided to do something about it. I utilized my skills and experience as an educator and writer and combined them with my passion for food and fitness. I created a totally new paradigm for low-carb living, as well as a collection of recipes. My husband lost weight, I lost weight and then my friends and family lost weight on the program. I shared my program and recipes on a blog, which then evolved into a website. I moved forward with my commitment to create a leaner, healthier and stronger America and world. I applied my skills as an educator (B.S. in Secondary Education from West Chester University) and as a former Curriculum Manager (retired from a position in curriculum development and delivery from a global pharmaceutical company). My biggest asset is that I am a caretaker by nature. I enjoy making people feel good and love to see people happy. It’s true that we can feel good by leading a fulfilling professional and personal life. However, there’s nothing like loving how our clothes fit! Feeling good results in confidence and then success follows. Everyone deserves to be happy! Get the look you want! Make it happen and then live your dreams! “Life, Liberty, and the pursuit of Happiness!” – a God given right for all of us! Thanks for the info, Will try the recommendations. It doesn’t seem like a lot of food but I know carbs are terrible for you. It’s funny everything in my refrig is on your list of Carbs to Avoid. Explains a lot. Good Job to you and Gary for the hard work!! Gary and I appreciate your comment! Thank you for taking the time to convey it. Have a wonderful weekend Green Eyes! We love your new look! In the fight against obesity and diabetes, we hope you’ll consider a few of our shirataki noodle recipes from our Skinny Dip Noodles website. We include basic nutritional info for all recipes. Shirataki noodles are a terrific aid for anyone trying to lose weight or maintain glucose levels for diabetes. We’re 0 calorie 0 carb 0 fat and gluten free! There’s no tofu so no soy/cancer concerns. And we’re certified organic! We’re a small family owned start-up and we would surely appreciate the support. I am happy to support your company. What is your website? Yes, I remember you and your wife, and our lively conversation on the plane ride back from Fort Lauderdale! It made for a very quick ride home! I am thrilled to hear you both successfully started the program, and made it past the first few challenging days! I am working diligently on the Carb Light Living™ Program and Recipe Book and am SO excited about the newest additions of previously forbidden “fruits” – literally – to the first phase! I can’t wait until the book is finished and everyone can read for themselves how easy it is to lose weight. When you follow the program, and stock up on the best tasting low carb breads, bagels, pizzas and desserts, it doesn’t feel like you’re missing out, which makes for a more sustainable program and lifestyle change. Healthy eating comes easy when you know the way. Your blog provided uus beneficial information to work on. You have done a marvellous job! I have a book with some of my favorite recipes.